Despite the fact that this was a show where a band played a classic album in full, a trend that has now become a sort of expectation, it was still an Animal Collective show which meant that anything still felt possible. Avery Tare and Panda Bear took their seats in the middle of a stage surrounded by acoustic guitars and a lone floor tom. Beginning with an extensive jam felt a bit unexpected given the night’s theme, but the two soon delivered the goods. For those who’ve seen the band over the past decade, this tour could not be more different from what fans have come to expect. Their acoustic album full of childish wonder, the songs felt as alive and expressive tonight as they did when freak-folk was at the height of its scene in the early to middle aughts. Avey’s wild and eccentric yips and howls were jolting and full of life and watching their faces contort in order to reproduce these wondrous vocals was as entertaining as the actual music itself. “Who Could Win A Rabbit,” with it’s spindling guitar opening measures, really saw the crowd settle into the night as cries of joy rang out and helped make everyone realize what was still ahead. It's an album built around nostalgia, childhood moments, and fantastical lyrics that seem to make no sense; hearing it come to life was an immediate rush to times gone by and flashes of moments that once again seemed bright in my mind. The tracks feel a bit simple, especially given what the band would later produce, but their delicate finger plucking mixed with psychedelic, acid-washed Beach Boy harmonies gives it a twist that makes it rather timeless. "Winter's Love" and "Kids on Holiday" were moments when the show seemed to really click into gear and watching the two in perfect sync on stage was truly mesmerizing. Their ability to feel the music and somehow keep time together through wild outbursts of screams and heavy guitar strums was incredible. "Visiting Friends" was a bit heady and saw their jam tendencies really come into play. Again, this may have been an 'album in full' show, but it was still an Animal Collective show. They're a group that never repeats and that translates to the stage as well. The nigh hit its emotional peak shortly after as the duo broke into the buzzing, yet serene "College" which was met with unparalleled delight and cheers from the crowd who shouted along the song's lone lyric with the utmost enthusiasm. "We Tigers" was explosive and and served as an unbelievable follow-up, the two seemingly bursting at the seams as the breakdown hit, and put the night above all expectations. 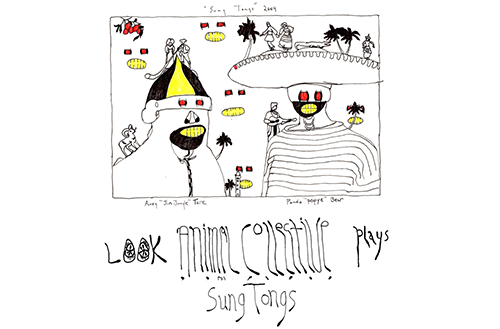 Sung Tongs could seem like a simple record on first listen, but after years and years of repeated plays, the dense nature and structure of each tracks reveals itself. Watching that unfold on stage felt special and innocent. A real dream that was rather unexpected, but every bit momentous and unforgettable.